ISO Standard 16331-1 - Leica Geosystems announce the new standard for laser distance meters. With the launch of the new Leica DISTO ™ D210 and Leica DISTO ™ X310 Leica Geosystems have defined a new standard for laser distance meters! Using a Leica DISTO ™ D8 with miniPLAN GO! Rapidly create floor plans as you measure. With its simple to use interface, miniPLAN GO! is designed to work in the same way that you do already. Perhaps I shouldn't advertise this too much in this litigious age where people are quick to take offence, but I worked out the height and width of my neighbour's house the other day - without leaving my office! He will also need about 5 litres of exterior emulsion to cover the 15.135 m2 of white wall in front of the house. We have a selection of animated product demos which illustrate the use of a DISTO measuring device. These useful tutorials cover a range of measurement tasks including simple, direct measurement, calculation of area, volume and using the Pythagoras function for indirect measurement. A comparison table of the advantages of laser distance measuring when compared to sonic measurement. Where distance measurement is concerned, quite a lot goes on behind the scenes. 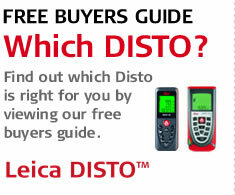 This article explains, in simple terms, exactly how the Leica DISTO ™ works. The Leica DISTO ™ A6, has been designed specifically for all those professionals who work regularly with CAD based packages. Over the years their Leica DISTO ™ product range, has enabled more than three quarters of a million professionals worldwide, to easily, quickly and accurately measure internal and external distances. Whether you have to stake out a construction site perform control measurements, collect height and angle data, align concrete forms, install ceilings and partitions, lay gravity flow pipe, locate underground services or complete site preparation and earthworks – Leica Geosystems offers the right instrument for your application.